When I go to Paris an overwhelming force hustles me into La Bon Marche Food Hall directly to the Celeriac Salad.! Its fresh crunchy creamy goodness is like a magnet! 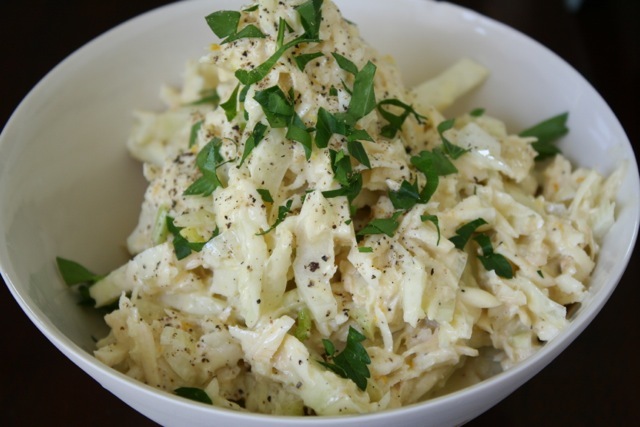 The tenderness of the Celeriac makes this “French Coleslaw” unforgettable. Here is my best shot ! In a small bowl combine mustard, mayo, olive oil and lemon and zest- whisk until incorporated. Toss well and refrigerate for at least 2 hours before serving. This entry was posted on Friday, July 13th, 2012 at 4:35 pm	and tagged with celeriac, cold, fennel, French, lunch, recipe, salad, side dish, slaw and posted in Category. You can follow any responses to this entry through the RSS 2.0 feed.